Tuesday January 25th, 2011 from 6:00 p.m. to 8:00 p.m.
Come by to play these award-winning handcrafted guitars & ukuleles, to meet the luthier and to enjoy a short concert by luthier and musician Jay Lichty. 6:00 to 7:00 Jay and Corrie will be on hand with a variety of Jay’s Handcrafted instruments. You are invited to come by to play any and all or simply to talk with Jay and to learn more about how they are built. 7:00 to 8:00 Jay will play an assortment of his instruments while sharing information and stories about each and about life as a luthier. Jay Lichty is a luthier and musician from Tryon, NC. 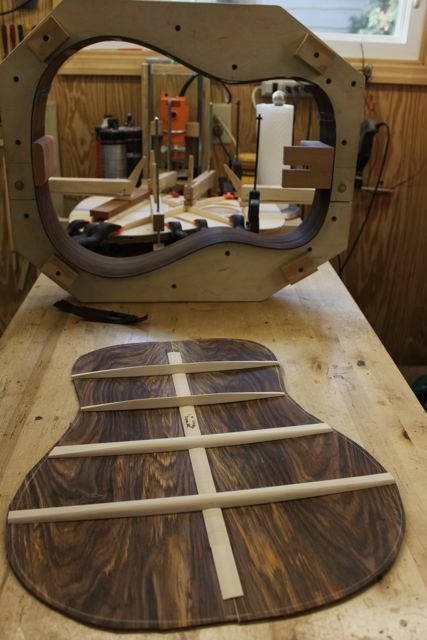 He builds one-of-a-kind handcrafted guitars and ukuleles from the highest quality domestic and exotic woods. His guitars have received critical acclaim, most recently as Winner of the Made in the South Awards, and many professional musicians now play Lichtys. Jonathan Gray, currently touring with SlowRunner and William Fitzsimmons. Having built his first guitar under the watchful eye of master luthier and guitarist Wayne Henderson, Jay credits his friend and mentor with having helped to launch Lichty Guitars.